Embodying Diaspora: Rumba workshop, March 13, 2018. Photo: Sara Pooley. Brittney Leeanne Williams, 2017-18 Artist-in-Resident. Photo: Sonia Yoon. Victoria Martinez, 2017-18 Artist-in-Resident. Photo: Sonia Yoon. The ten-month Artist-in-Residence program for individual artists places specific emphasis on those whose work critically engages issues of race and ethnicity and works to advance their artistic ambitions and opportunities. During this program, resident artists have access to rehearsal, performance, and exhibition space at or near the Arts Incubator in Washington Park, as well as access to the academic and research resources of the University. Victoria Martinez is a transdisciplinary artist and educator from Pilsen who explores textiles, installation art, site-specific experiments, printmaking, and painting. She believes in chance and intuition, creating ephemeral experiences inspired by the urban environment, Mother Earth, and fiber, a universal material that connects us all despite of our background. Martinez works with overlooked spaces, marks and items, sewing and weaving them together to create fresh perspectives. She has exhibited at Northwestern University, Hyde Park Art Center, Chicago Cultural Center, the Gaylord and Dorothy Donnelley Foundation, the National Museum of Mexican Art, The Franklin, Duke University, and University of Minnesota. Upcoming projects include group shows at Pelican Bomb Gallery in New Orleans and a solo exhibition at Loyola University Museum of Art. Arif Smith is a multidisciplinary artist and educator. His performance- and video-based work centers on diasporic citizenship and African-rooted performance practices, exploring notions of blackness, co-presence, and marronage. Smith received his BA from Oklahoma State University. He also participated in the performance studies graduate program at Northwestern University. Additionally, Smith has curated exhibitions and symposia at Williams College and Massachusetts Museum of Contemporary Art (Mass MoCA). He is currently a member of Bomba con Buya and serves as program manager at Changing Worlds. Brittney Leeanne Williams is a Chicago-based studio artist who is originally from LA. She attended the School of the Art Institute from 2008-2009. Her work has exhibited in Los Angeles, Chicago, Madison, WI, and Ann Arbor, MI. She also does conceptual work, including set design for the short film Self-Deportation (which has screened at film festivals nationally and internationally, including the 15th Annual DC Asian Pacific American Film Festival and the Pineapple Underground Film Festival, Hong Kong). She most recently has been a resident for Chicago Artist Coalition’s HATCH residency and attended Skowhegan School of Painting and Sculpture this past summer. The artist talk featured the 2017-18 Artists-in-Residence: Victoria Martinez, a transdisciplinary artist and educator from Pilsen; Arif Smith, a multidisciplinary artist and educator; and Brittney Leeanne Williams, a Chicago-based conceptual artist. ​Brittney Leeanne Williams is working on a spring project that situates the Black body within the landscape painting genre. Williams uses observational painting techniques to construct landscape as a space of emotional escape. During her residency, Williams will use Washington Park as a natural subject and as a studio for outdoor painting sessions. Starting this spring and summer, Williams will be painting in the park, capturing the park’s pastoral scenery created by Fredrick Law Olmsted and Calvert Vaux in the 1870s. As the weather warms up, keep an eye out for Williams and her easel. 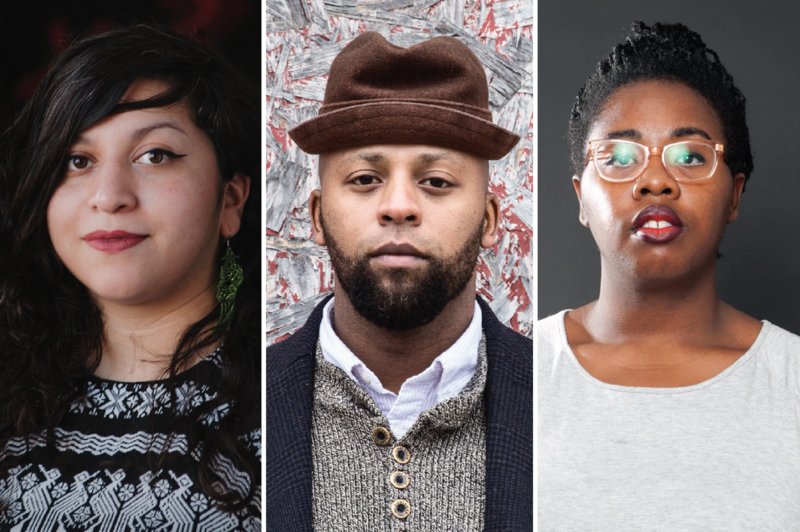 Carrying A Place Called Home is the culminating program for the 2017-18 resident artists, Brittney Leeanne Williams, Arif Smith, and Victoria Martinez. The exhibition features new works the artists produced during their ten-month residency at the Arts Incubator in Washington Park that reflect on identity, memory, and place through painting, collage, dance and video. Artist Residency programs are supported by Arts + Public Life, the Center for the Study of Race, Politics, and Culture, and The Joyce Foundation.